This page details issues related to copyright for the site and for all authors who participate in this platform. All authors are required to agree to the copyright email forwarded to them. Authors hold all copyrights to their articles and are solely responsible for all content they upload to the site. Naturally, this includes all text, images, video, and any other format or content shared on this platform. All articles are published by the authors themselves, or with the direct permission of each author. Without exception, no article can be reprinted without the permission of the author and/or Israel Blogger. Writers hold sole responsibility to verify that they have not violated any copyright, slander, libel, etc. laws and have agreed, by posting to this site, to take full responsibility for the pictures and text they post. 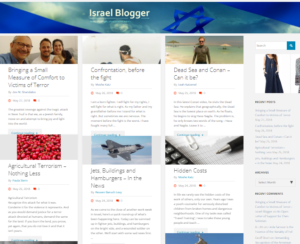 Israel Blogger offers a platform on which others can share their voice. Each author, by posting to this site, assumes full and complete responsibility for all contents posted under his or her name. As such, it is the responsibility of each author to ensure copyrights are honored in all instances – pictures, words, videos, etc. First, topics must be related to Israel and/or Jewish matters either in Israel or in the diaspora. Second, topics that support genocide, terrorism, racism or other opinions that fall well outside any range of normal acceptability are strictly forbidden. Also, though the creators of Israel Blogger abhor censorship, we reserve the right to remove an author’s privileges if these rules are violated. Further, these rights can be removed at any time and without prior notice. Israel Blogger provides the platform. Ultimately, each author assumes FULL responsibility for the content that he or she offers (uploads, emails, etc. ).